Let’s start with the latest media commentary on “The Housing Market” – an elusive term at best. We’ve been told that the Australian Housing Market is overheated and could fall by 40%, but the fact is there is no such thing as a single housing market in Australia. As you can see from the chart below, there’s not even a single housing market in each capital city. Instead, there are many housing markets within the “Housing Market”, all doing their own thing. How can you compare an apartment in Melbourne with a townhouse in Subiaco? Or a house in Brisbane or with a mansion on Sydney harbour? All over Australia some markets are rising while other are falling, and others still remain flat. In addition, real estate figures are notoriously unreliable, not taking into account improvements made by owners, which can be significant. Headlines about booms can lure inexperienced buyers into the market, while tumbling scenarios can scare some people into selling, or out of making a good decision to buy. Some media outlets are quoting “experts” who say the housing market is going to fall 40% (you don’t get on TV or generate clicks on YouTube if you have anything boring to say). Australia’s population is on track to reach 40 million within 35 years, which is a positive for anybody who buys well-located, quality real estate and hangs on to it for the long-term. Australian immigration growth over the last 10 years has averaged 1.69% pa, and is expected to continue at that rate for the foreseeable future. Those immigrants need to live somewhere, and that demand will help soak up excess supply. A portion of residential building approvals from recent years have already been cancelled or deferred. The changed market conditions and tighter lending conditions mean that some of that supply will no longer come to market. We have recently seen a myriad of new infrastructure projects earmarked by the Federal and State Governments – MetroNet in WA, rail projects in Queensland and Melbourne and other infrastructure spending. On top of this there are expanded, and new, mining projects in WA. All this suggests an increase in growth, which leads to an increase in jobs (especially in WA). Eventually that will translate to an increase in housing prices. We see engineering and planning first, then construction, which will all eventually filter through to the property market. Our historically low RBA cash rate means that rental yields and mortgage rates are relatively close to each other. That means that, if necessary, people can service their mortgage by renting out their property and moving in with someone else. For forced selling to occur, either rental yields would need to fall, or mortgage rates would have to increase substantially. Australians dislike selling their homes at a loss even if they are buying and selling in the same market. This typically results in house prices flat-lining for extended periods rather than experiencing short, sharp falls. Australians will default on anything else before they default on their home. This means you will see dips in discretionary spending, and increasing credit card and car loan defaults, before any meaningful mortgage defaults. It’s hard to overestimate how much of a political football housing is in Australia. The Australian Federal Government, along with their State counterparts, has a long history of enacting policies that support house prices (e.g. first-home-buyer grants), if a sustained sharp downturn is experienced. Australian house prices have fallen for ten consecutive months driven mainly by declines in Sydney and Melbourne, which are both coming off the back of huge booms. Nationwide, a further 5% decline is expected. We’ve seen a tightening in bank lending standards, an increase in the supply of units and poor affordability levels. We’re also seeing investors and buyers saying, “well, I was trying to get in there for fear of missing out, now there’s no hurry because prices are coming down”. All of those things are weighing on prices. At the same time, some of the banks have raised mortgage interest rates, and, of course, there is speculation about a possible change of government to Labor, with talk of its plans to tighten or restrict negative gearing and the capital gains tax discount. 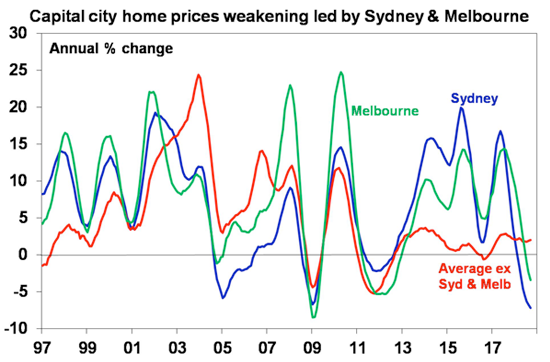 But further property weakness will be dominated by Sydney and Melbourne. Sydney property prices are up 70% over the five years to their peak last year while Melbourne property prices are up almost 60%. 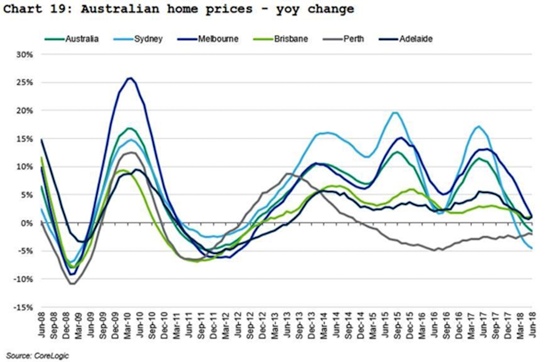 Sydney and Melbourne have seen price declines of around 3% to 6% from those peaks, and there is probably another 10% more to go, spread out over the next couple of years. But if you’re in other cities around Australia it’s a somewhat different story, because those markets didn’t have a boom. There’s still value to be had there in rental yields, which are still reasonably attractive. Perth and Darwin have just come off the back of a huge bust, so, if anything, they seem to have bottomed. We’re probably going to see moderate growth over the next couple of years. As for other cities – Canberra, Adelaide, Brisbane and Hobart – we see moderate growth in those cities. We’re not saying that the Australian housing market doesn’t have issues. It does. But, while we are likely to see ongoing weakness at a national level over the next couple of years, it is clearly a tale of two nations, with the post-boom Sydney and Melbourne markets set to weaken, and other markets to show some growth. To get meaningful price falls in Australia, you need meaningful forced selling. That would require unemployment to increase substantially and, with the employment market still relatively tight, it is hard to see anything near a 40% housing correction from here. This publication has been prepared by AustAsia Financial Planning Pty Ltd AFSL 229454, AustAsia Accounting Services Pty Ltd Registered Tax Agent No 7587 3005 and AustAsia Finance Brokers Pty Ltd, Australian Credit Licence No 385068.